Mole crickets are common turfgrass pests. Three species of mole crickets are considered pests in the Southeast United States. 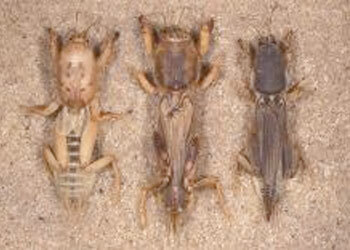 : tawny, southern, and short-winged mole crickets. Mole crickets make tunnels in the ground, severing grass roots and causing the earth to bulge upwards. They also eat the roots and shoots of grass. Mole cricket damage looks like ugly brown patches.